Every year, May the 4th, or Star Wars Day, gets bigger and bigger, and LEGO never misses out on a chance to drive more LEGO Star Wars sales. For the past several years, LEGO has offered a free exclusive giveaway on May 4, and this year is no exception. 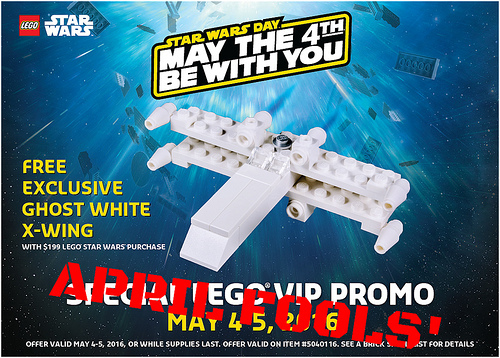 This year’s promotional giveaway will be an exclusive microscale Ghost White X-Wing set, free with LEGO Star Wars purchases of $199 or more. The offer should be valid in stores and online. Anybody knows what’s today’s date? Looks great! Makes me reconsider not getting Hoth Base. Hope they release a black one at some point.